The recent popularity of cheese tarts in Hong Kong drew my attention. I saw many people line up for hours for the tarts. I was so intrigued that I decided to make some for my family to try. I really wanted to get an “oozing” effect to amaze my husband. It wasn’t as hard as I thought! First and foremost, know your oven and work with it. All you need to do is not to bake the cheese tarts for too long. Make sure you remove them from the oven just in time, exactly like when making molten chocolate cakes. The cheese filling is so smooth and creamy, that it goes really well with the crispy tart shells. Sift the flours and place in a food processor. Add sugar and salt. Pulse a few times. Add the cold butter. Briefly pulse 5 to 6 times until the mixture resembles fine breadcrumbs. If you don’t have a food processor, rub the butter into the flour mixture with your finger tips. Move quickly, otherwise the butter will melt. Transfer the mixture into a large mixing bowl. Add in the egg. Use your palm to lightly knead it into a dough on a clean surface. Don’t over-knead it though, as you don’t want your tart crust to turn tough. Form the dough into a disc and wrap with cling film. Refrigerate for 25 minutes. Remove the dough from the fridge. 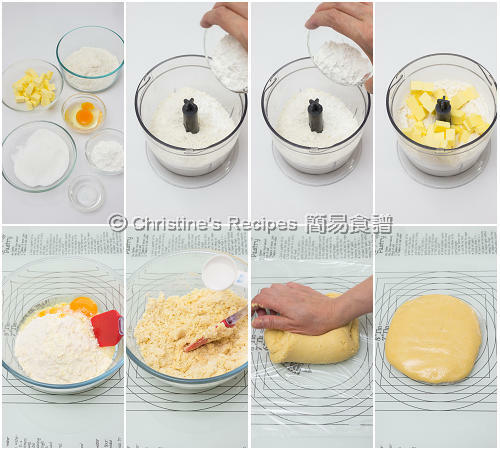 Sprinkle some flour on the surface and roll pastry out to ½ cm thick. 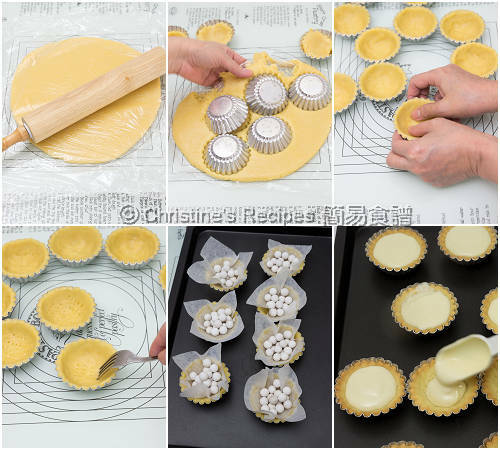 Cut out the pastry and line the tart tins. Use your thumbs to press evenly, starting from bottom up to the sides. Prick the base with a fork. Line with baking paper and place pastry beads or uncooked rice or beans on top. Bake the pastry shells in the preheat oven for about 10 to 12 minutes, or until the edges turn brown. Remove from the oven and let them cool on a wire rack. To prepare the fillings, in a small sauce pan, pour in the milk and sugar. Heat over medium heat. Add the cream cheese, ricotta and parmesan cheese. 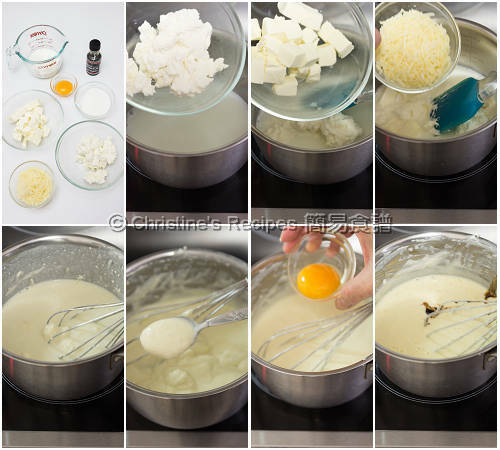 Stir constantly and cook until all the cheese is dissolved and the mixture is very smooth. Remove from heat and let it cool down a bit. Stir in the egg yolk. Add vanilla extract. Let it cool down completely. Spoon the fillings into the tart shells. Bake in the preheated oven for about 8 to 10 minutes. Remove the tarts from the oven and place them on a wire rack for ½ minute. Remove from the tins. Serve hot. Sprinkle cocoa powder if desired. The leftovers can be refrigerated in an air-tight container after completely cooled down. Reheat them in a low-temperature oven. All three kinds of cheese are available at supermarkets or bakery shops. While cooking cheese, make sure to stir constantly to get a smooth texture. The power of every oven is different. Adjust the baking time accordingly. 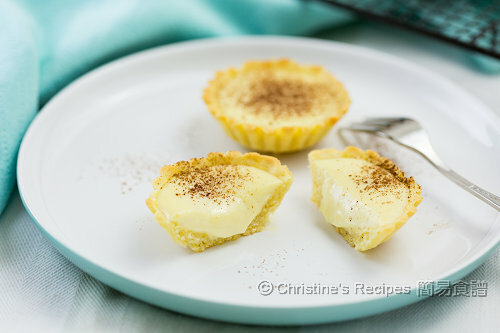 I love that you baked these mini cheese tarts with 3 different kinds of cheese. They look irresistible! But I like this version too. Give it a try. Let me know how it goes if you try. Since yours look different, do they taste the same? And can I just put them longer in the oven in order to get the brown crust? Yes, sure. If you want to replicate their presentation, you can use a larger tart mould and make the crust thicker then bake it darker. We like the crust made from this recipe too. You may give it a go and see how you like it. hi Christine, thanks for sharing. Btw whats the exact temperature did u use when baking the filling inside tart shell? Hello Christine! If I do not have ricotta & Parmesan cheese, can I replace it with purely cream cheese? Both of the ricotta and parmesan are for creating a unique texture of "oozing” effect and cheesy taste. If both of them are not at hand, feel free to experiment to use cream cheese only then. Can I use the egg tart recipe for the crust? This crust is lighter going well with the cheese. 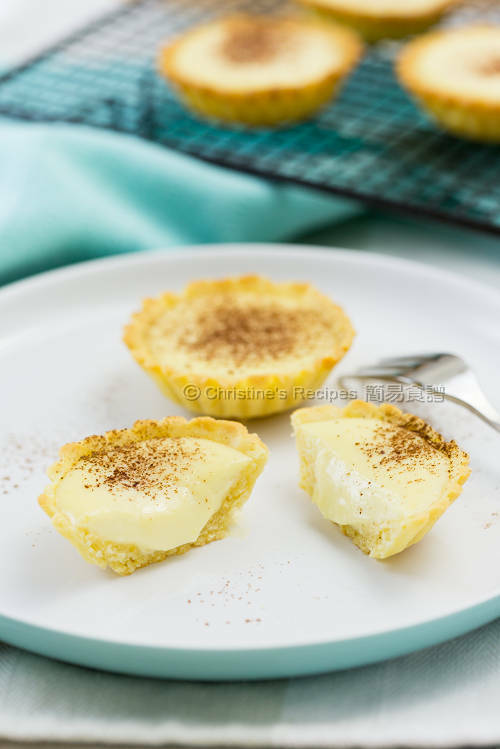 But you can use the egg tart crust if you like. Followed your recipe .My cheese tart came out just perfect .God bless. Congrats ! Happy baking ! Instead of 3 types of cheese, can I use cream cheese only? Sure, you can use cream cheese only. The end product will be very different from mine, but it'll work. Feel free to experiment. Great experience baking with your recipe! ◡̈ my guests loved it! Glad to know. Thanks for trying my recipe. Love the recipe! I replace ricotta with cream cheese. It's pretty good in my opinion. Shall try it with ricotta next time. Thanks for sharing your recipe! Good try. Thanks for sharing your tip. I just brought your cookbooks, both of them while in Hk. I'm from Australia and it was impossible finding a copy here! First the dough was quite crumbly, didn't want to still together. I found that the longer I worked on the dough, the stickier it became. I suspect it was to do with the temperature. Your recipe calls for cold better so I used it straight out of the fridge, was I supposed to leave it at room temp? The cheese I found also crumbly in the pot. I mixed it together and was constantly stirring but the cheese never got to point where it was smooth, almost like bits of crumb cheese in the mixture. It didn't ooze either, does that mean I overbaked it? First of all, thanks for your support of my cookbooks. So sorry to hear about the bad experience of trying to make this cheese tart. You need cold butter that will help produce flaky tart base. Let the butter from fridge rest at room temperature for a few minutes until it's soft to touch and workable, yet not too soft or melted. You need to move fast. The idea is to rub the cold butter into the flour and create some sandy texture. If you knead the dough too long, or the weather is too hot, the butter will be melted and make your dough greasy and sticky. That's not what you want. The key to making oozing fillings is not to over-bake the tarts. If the fillings baked too long, you won't get the effect. Bake shorter time if you try next time. The design and power level of every oven is very different. Try to figure out the optimal baking time with your own oven. The last line of the filling recipe says "cook down completely" What does that mean? Sorry, it's a typo. It should be "Let it cool down completely." I've updated it already. You're right! Happy baking !